One of the ways in which we have had to adapt to life in Uganda is the difference in taking a shower. Showering here is something that I know needs to be done, but it is not really a way to relax. One evening while I was taking a shower, I was longing for a shower where I could stand under warm running water and just relax. 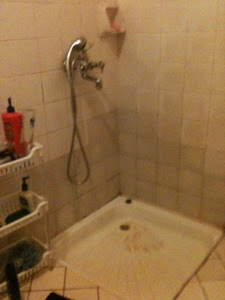 Our shower here is a small square on the floor with a slow drain and a hand held shower head, and a small water heater. If you want to take a shower, this is the procedure. First, turn on the hot water heater and wait for 10 minutes. (We do not leave it on all the time because electricity is so expensive.) Once the water has heated, you go stand in the shower pan, pick up the shower head, adjust the temperature, rinse off, get your hair and the washcloth wet, and then turn off the water. Of course, then you feel a bit cold, so you quickly shampoo your hair and soap up your body. Then you pick up the shower head again, adjust the temperature again, rinse off again and turn the water off again. If you want to use conditioner for your hair or shave, that needs to be done at this time. Then you pick up the shower head again, adjust the temperature again, rinse off again and turn the water off again. I have also been in the middle of a shower several times when the power went out. That is an adventure! As I was standing in the shower, a bit frustrated about all the work required for showering here, I was reminded of how people bathe in the village. First they carry a 20 liter jug to fetch water, which may or may not be clean. If they want the water to be warm, they light a charcoal fire and put the water in a pot to heat. The water is poured into a basin which is then used for washing and splashing onto their bodies. We have often seen children in front of their houses bathing in this way. As I stood there in my shower, my heart changed from coveting a relaxing American shower, to thankfulness for running, warm water, even if it only lasts 5 minutes. I am learning that with most things, I can choose to focus on things that I wish I could have, or I can choose to be thankful and count my many blessings. Good times with my parents!